For over 2 weeks, hurricane news has dominated this countries attention. It began when Harvey struck S.E. Texas, and the relief efforts, then all eyes quickly turned to watch hurricane Irma. For many, prayer has been the only thing that gives them comfort, while others are using these storms as evidence that God doesn’t exist, for if He did, then why does He allow such suffering? 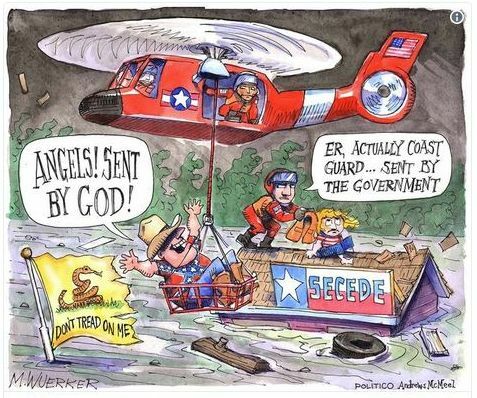 One editorial cartoon mocks those who praise God for being rescued. FIRST, the problem of suffering from natural disasters is not automatic proof that God is not real or uncaring. On the contrary, it offers proof that GOD IS REAL! When someone attempts to disprove God by pointing at suffering, their idea of suffering can only be true if there is a standard of good, and there is someone who sets that standard. That someone is GOD. If God were not real, there can be no standard by which to determine if something is wrong. For there to be a wrong, there must be a right. For those who reject God in favor of evolution, then every natural disaster is just the result of the continual process of evolution. Therefore, your subjective feelings are the only standard by which you object to natural suffering. You may not like it, but without God, you cannot say that it is bad. It’s just nature doing it’s job. SECOND, we should ask the skeptic how they would put one of these things (the earth) together. How would they run the world? How would they deal with free will and the problem of sin? How would they create a planet where gravity only works when we place something down, but never breaks bones when a person trips? How would they get heat to cook food and to keep us warm without the possibility of forest fires? Would they interfere every time something bad was about to happen? If they prevented every injustice, would there be free will? If they stepped in to prevent every death due to natural catastrophe, would the people simply regard that as just the way nature works and be atheists anyway? How would they feel, if they could put one of these together, when their creation considered their benevolent activity as just nature doing what nature does? LAST, If God were not real, the atheist has no answer for how wrongs are eventually made right. For the Christian, we believe that all wrongs will be righted and that all evil will be dealt with. The word from our Lord says; “Vengeance is mine; I will repay,” [Romans 12:19]. We believe that we all must appear before Him and; “…that every one may receive the things done in his body, according to that he hath done, whether it be good or bad” [2Corinthians 5:10].